I’ve never played Four Swords. I’ve always wanted to. Overall, I like the way the art turned out, but I don’t like the backgrounds that much. It’s so BROWN. I don’t know. Locke needs to watch his language. This entry was posted on Friday, May 1st, 2009 at 12:00 am and is filed under Comics. You can follow any responses to this entry through the RSS 2.0 feed. Both comments and pings are currently closed. FIRST AGAIN! I win! If it makes you feel better. I agree with it. I do love how he goes from terrified while being picked up, to being pissed as he realizes his involuntary sacrifice. By the way, planning on doing another game review anytime soon? MasterVayne, I’ve been meaning to do reviews again, but this is my final month of school. Meaning finals, tests, etc. I’ll try to post if I can but there are no guarantees. Also, Link Alice is surprisingly cute. 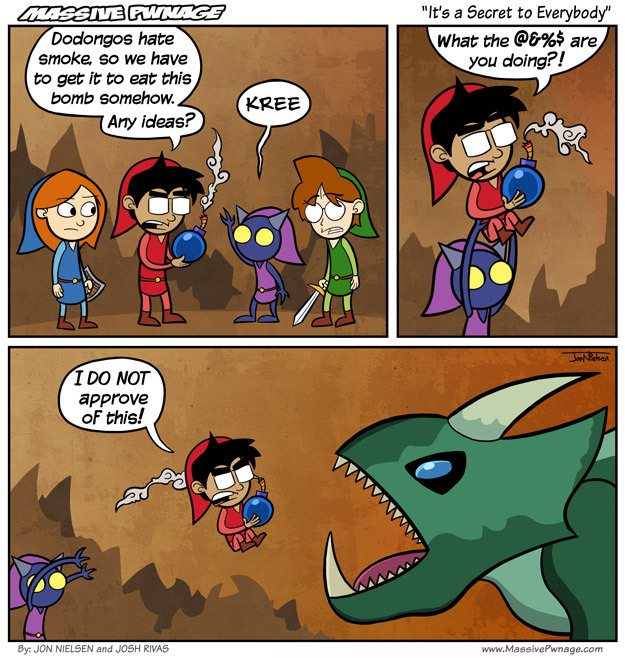 Yea that boss was a pain…i ended up getting eatin about eleventy times.if thats a number…..
Looks like the boss from the Dodongo Cavern in OOC, never played 4 Swords.